Note: Combo Boxes can also be referred to as drop down lists. If you see a (?) I have included a help box, at the bottom of the page, to refer to if you need a bit more help with this step. Not everyone does, so in order to keep the instructions concise and to help those that are still learning, I thought this was a reasonable compromise. Set up your two combo boxes. Make sure you choose a field in both combo boxes that can be used to link and filter each of the combo boxes. As an example, I have included a graphic below, that depicts two related tables. Table1 and Table2. Table1 has the list of Departments in a hospital and Table2 has a list of units. 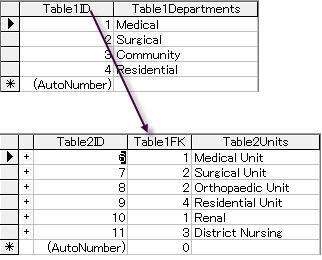 Each of the units is linked to the Primary key in Table 1 as illustrated below. Choose the 'Other' tab take a note of the 'name' of the Combo Box, you will be using this later. 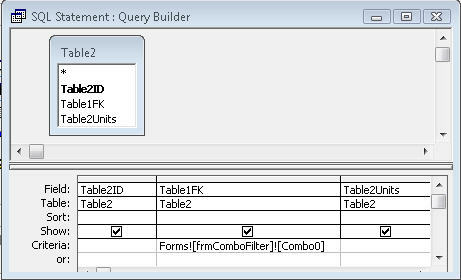 This opens the query related to the combo box. Where frmComboFilter is the name of the form containing the combo boxes. And, Combo0 is the name of the first combo box you have just made. You will need to change these names to match the name of your form and combo box. The Macro Window will open. Where Combo2 is the name of your subcategory combo box (the combo box you wish to filter). Once again change Combo2 to the name of your combo box. Close and save the Macro. Try it out and see if the Combo Box filter works for you. (?) Right Click and Select Properties from the drop down list to open the ‘Properties’ window.